A parking facility for coaches visiting Dublin provided by the National Transport Authority at a cost of €1.7m is being snubbed by some coach operators who say it is not meeting their needs. Figures released to RTÉ's Morning Ireland show that for six weeks the coach park was completely empty. On average, the facility has never been more than half full, even during peak summer months. The 50-bay facility at Sheriff Street in Dublin's Docklands was opened in January to allow vehicles to park after dropping passengers into the city centre. It costs the NTA up to €150,000 a year to operate. The initiative was designed to prevent coaches from clogging Dublin's streets for extended periods. It is open Monday to Friday from 7am to 7pm. However, coach operators say the hours are too limited, particularly because no overnight parking is permitted. The NTA confirmed that the coach park had been used on average by nine vehicles per day since January. As part of the planning process the NTA had estimated the demand for coach parking at 77 coaches a day during peak season. Even in its busiest week in August, an average of 22 coaches parked in the facility each day. 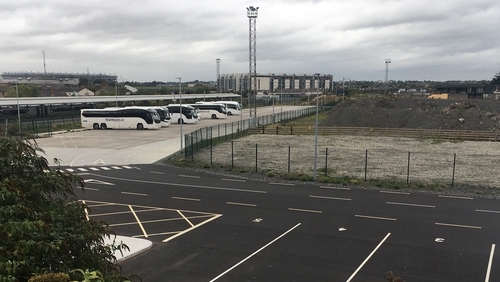 Coach Tourism and Transport Council of Ireland spokesperson Caoimhe Moloney Kavanagh described the facility as superb, but said its opening hours were "no use to any coach operators". Ms Moloney Kavanagh, who is operations manager with Pierce Kavanagh Coaches in Urlingford, Co Kilkenny, said: "At night time we offload passengers to their hotel and then where do the NTA expect us to put our coach? "The industry in general is not using the coach park. The majority of coach companies operating tours into Dublin are not Dublin-based so they don't have yards in the city." She said none of her company's 42 buses use the designated coach park and questioned the reluctance to allow vehicles to park overnight. "Dublin Bus has a garage in Ringsend and it is surrounded by residential areas so I don't know what the difference is. There is a freight company right beside this facility and there are trains going through there at night," she said. The NTA said the volume of coaches using the parking lot was lower than expected but that it did not anticipate reaching full usage until Dublin City Council further reduced the availability of on-street parking. Asked whether there was any scope to extend the facility's opening hours, NTA Deputy Chief Executive Hugh Creegan said the coach park was in a residential area and it was limited by planning permission. "The key issues the operators had was daytime business hours. That's what the coach park was built for and that is what it is working for," he said. Retail Excellence, which represents retailers in the city, described the usage figures as "deeply disappointing". CEO Lorraine Higgins said the coach park was "not servicing the retail industry and business of Dublin like it was designed to do. That means increased traffic congestion and increased pollution. "We really need to go back to the drawing board and see how we can make it operate more effectively."